This article will assist you with claiming ownership of your Custom Subdomain with search engines. If you're using a custom domain for your IDX Broker pages, it's likely you already know about the SEO benefits it can provide. You probably already know of the importance of managing your web presence and keeping track of what the search engines see. Within Google Search console, navigate to Webmaster Central. Here you'll need to add the property (domain) you want to verify. Next, you can click the Manage Site button and Verify this site. Look for the option to verify by "HTML Tag", this could be in the "Alternative Methods" or "Recommended Method" tab (depending on where Google has presently decided to put it). 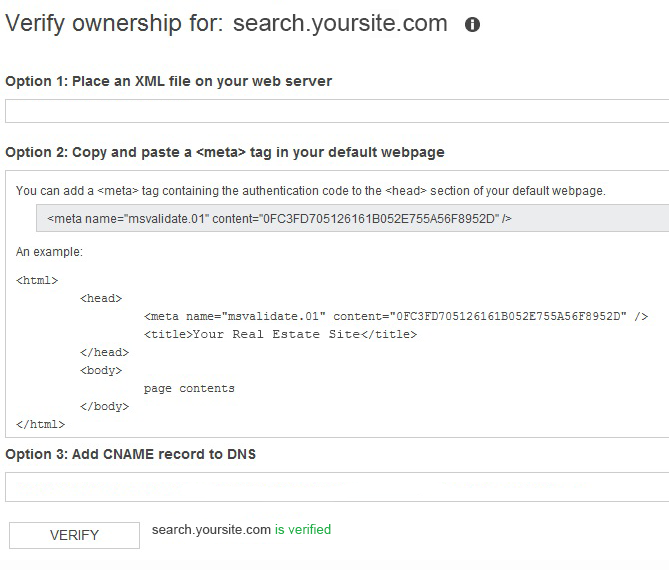 Following the Search Console instructions, add the verification tag to your homepage (the main page of your website, not the wrapper page) in the <head> section before the closing </head> tag. This may seem a little counter-intuitive, but Google needs to find this on your primary domain, not the subdomain. You will need to leave this verification code in place, in case Google checks for it again in the future. Once you've done this, you can click on the "Verify" button. Your Custom Subdomain should successfully be verified. When you sign up for a Bing Webmaster tools account you should be provided a verification code. Copy the displayed <meta> tag with your custom ownership verification code to the clipboard. Add the verification tag to your homepage (the main page of your website, not the wrapper page) in the <head> section before the closing </head> tag. Make sure the <head> section is followed by a <body> tag.